East Campus housemasters Julian K. Wheatley, a senior lecturer in Chinese, and his wife Marjorie Nolan-Wheatley have announced their decision to leave MIT at the end of the academic year. The Graduate Students Office has chosen recipients of the new Graduate Student Life Grants for this year, ranging from a drag show called “Fierce Forever” to “Peer2Peer,” a discussion group on tolerance. The grants are intended to provide resources for students to explore ways to “build community” through innovative proposals, rather than imposing top-down policies. Approved projects range in inclusiveness, with some addressing a small subpopulation of graduate students and others open to all members of the community. Nine presidents of leading research universities, including Susan Hockfield, issued a joint statement on Tuesday pledging to break down still existing gender barriers in higher education. 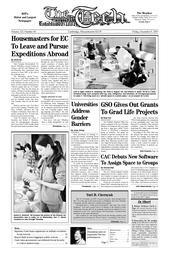 The new virtual computer system implemented by the Campus Activities Complex to assign event space to student groups has encountered difficulties in its recent debut. Yuri B. Chernyak, an MIT research scientist, died unexpectedly Nov. 23 at the age of 60 in his home in Waltham. His wife, Natasha Chernyak, said he suffered a sudden heart attack. The following incidents were reported to the Cambridge and/or MIT Police between Dec. 1 and Dec. 7. This summary does not include incidents such as suspicious activity, false alarms, general service calls, or medical shuttles. The military wants access to law schools on the same basis as other potential employers seeking to recruit students, although openly gay law students, of course, need not apply. The law schools insist that only those employers who pledge not to discriminate, against gay men and lesbians or anyone else, are welcome. Nearly half the states are doing a poor job of setting high academic standards for science in public schools, according to a new report that examined science in anticipation of 2007, when states will be required to administer tests in the subject under President Bush’s signature education law.